Hello there 🙂 thought I would share a different kind of post today- a life update kind of post. Those of you who follow me on Instagram already might know that my blog was featured in the newspaper. I decided to write a post about it and share the article in English for my readers and friends back home in India. Last month I received a call from a journalist for a very popular Polish Newspaper here in Krakow- Dziennik Polski. I was surprised at first, as he said that he wanted to talk to me about an article he planned to write; something about foreign bloggers living in Krakow. I have only started blogging about a year and a half and wondered at first if I should say, yes! He said that we had to meet quickly as the article would be published on Saturday and it was already Thursday. Which meant we had only that evening to have a conversation and then he would write the article on Friday before it went for publication later on Friday evening. I did not think twice and said YES! We talked about how and why I came to Krakow and my life here. We also talked about my likes, what I do for a living, we talked about my blog and what its like to be a foreign blogger in Poland. This was the first time that I have had this wonderful opportunity and thought I would share the experience with you. So without further ado here is the translated version of the newspaper article. New posts are published in between working in a corporation and going to the gym. 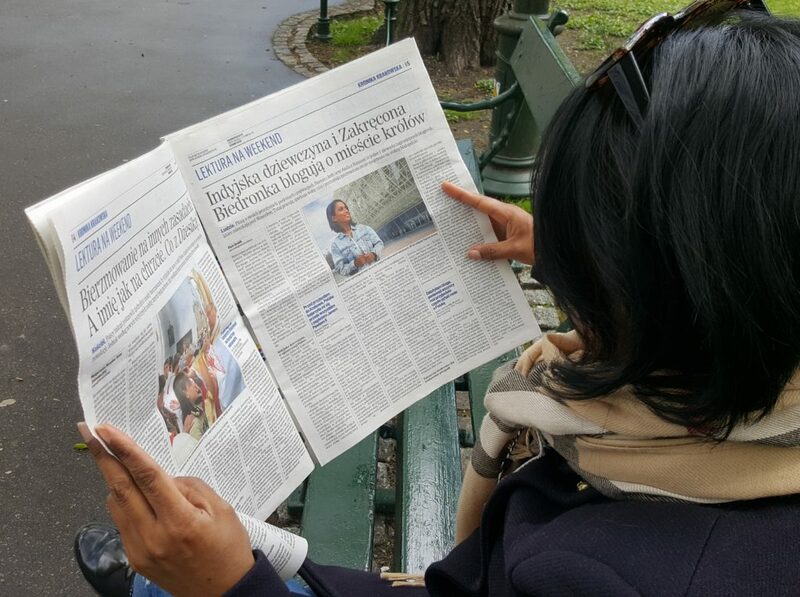 On the blog ‘Indian Girl in Poland,’ she writes mostly about her life and a bit about fashion. Doreen, a small brunette, poses in the photos against the background of all known places in and around Krakow. Tauron Arena, the colourful stairs in Podgórze, Kotlarski bridge etc. Doreen also shares with her readers her travel experience. 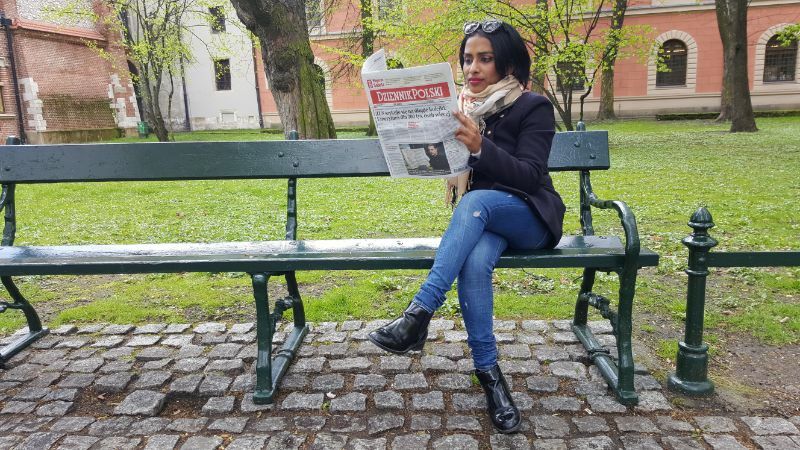 Not only of faraway places but also around the streets of Krakow – “I also try to write about Krakow, because not many people abroad/back home know this city well” – say’s Doreen Pinto, who comes from India. She belongs to a modest group of foreign bloggers who lives in Krakow. And most importantly, they are bringing their glimpse of the capital of Malopolska to the world! Even a few years ago, Doreen did not know much about our country. Before coming to Krakow she was aware of Pope John Paul II – she recalls. The blogger was raised in the city of Mangalore in the South of India. Doreen, unlike most of the people in her homeland, is a Christian – “many people are surprised because India is associated mainly with Hinduism and Islam”– she says. Doreen is working in the financial department of a large US IT company and has started her career in India. She always wanted to try to work abroad, but she did not expect an offer from exotic Poland- “My manager presented me with a proposal to transfer to Krakow. At first, I did not know where the city was. Fortunately, it turned out that it was Europe, where I had previously travelled”– indicates Doreen. Before she came to Poland, she had travelled to Great Britain and the Czech Republic. Her closest relatives were happy when they learned of her move to Poland. “Most families in India are conservative and could not agree to leave their daughter to go to the other side of the world. But my family is open and I can count on their support” – says Doreen. Today, the blogger from India knows the city where he has lived for almost five years. “I love to walk to the Main Market because I live in the neighbourhood. In addition, I like to relax at The Forum“. Many of these places are scenery for the fashion photos that she has for her blog. The blogger realizes that more and more foreigners are moving to the capital of Malopolska. This is confirmed by the data of the Voivodeship Office in Krakow. Only last year more than 20 thousand. Work permits for foreigners in Małopolska. Among the most popular nationalities that settled in our voivodeship are guests from neighbouring countries like Ukraine, Moldova or Russia. However, close to them is the high number of visitors from India, who are undertaking permanent work on the Vistula River (in 2016 308 permits were issued to people from this country). For Doreen Krakow is open to the newcomers to the city. She has never encountered discrimination while living here. On her short list of disadvantages of life under the Wawel, smog takes the first place-“I come from a country where there is also a large problem with air pollution. However, in my homeland most people do not take this problem seriously”– says the blogger regretfully. And her advice to the people of Krakow would be to do carpooling whenever possible. Her current blog has been running for a year. In addition to the fashion posts, she also writes about reviews of places in Krakow-“I love Polish food, and I like Polish dumplings the most. In addition, I have recently turned vegetarian and I check the restaurants where the kitchen serves veg food” – she adds. However, she believes that the choice of the latter is still too small. Well, let me know what you think? I am still buzzing with excitement over it. Disclaimer: I am truly grateful for this wonderful experience.